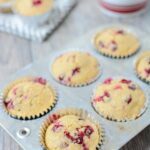 These Cranberry Corn Muffins are lightly sweetened and bursting with tart fresh cranberries. They make the perfect dinner side dish. Serve them with a hearty chili or make a batch for your holiday dinner. Mix melted butter or oil, eggs, milk and sugar in a bowl. Add flour, cornmeal and baking soda and stir to combine. Stir in cranberries until just mixed and scoop into greased or lined muffin tins. Bake 22-25 minutes at 375 degrees F.